On April 6, 2018, at approximately 9:50 p.m., officers responded to a shooting call at 500 Early Dawn Trail. 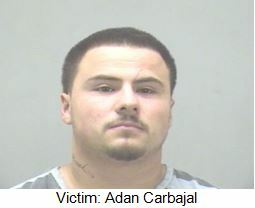 The victim, Adan Carbajal, a Latin male 31-years-old, was shot multiple times and died as a result of his injuries. Anyone with information regarding this offense is encouraged to contact Detective Scott Sayers, #7157 at (214) 671-3647 or scott.sayers@dallascityhall.com.